When may be an appropriate time to invest - what a great question. Discipline is a part of a sensible lifestyle yet it appears to be something that is often forgotten when it comes to investing. We often hear of ‘horror’ stories where people have made investments at the top of the market and sell out in a panic resulting in great financial loss at the bottom of the market when things are not going as well. These stories usually tell of investors who have been caught up in the emotion of buying on hype and forgetting sound fundamentals. One simple solution to help guard against this problem and help make money in the downs as well as the ups is a successful strategy called Dollar Cost Averaging. Basically the process involves not worrying about where share and property prices or interest rates are headed. You simply invest a set amount of money on a regular basis over a long period of time. The strategy is to ride the ups and downs and it should make little difference to the end result as to what the market was doing when you began investing. Your money automatically buys less when the market is up and more when it is down. If banana’s were $10 a kilo and you had $20 to spend, you would get two kilos. If the price dropped to $5 a kilo, you could get four kilos. As another example, by putting $100 per month into a managed investment which starts at $10 per unit at the beginning of the year, drops to $5 through the year and returns back to $10 at the end of the year, that even though the value of the investment halved through the year and only managed to return to its original value the investor made a handsome profit. You can see the example of the regular investing in the table. 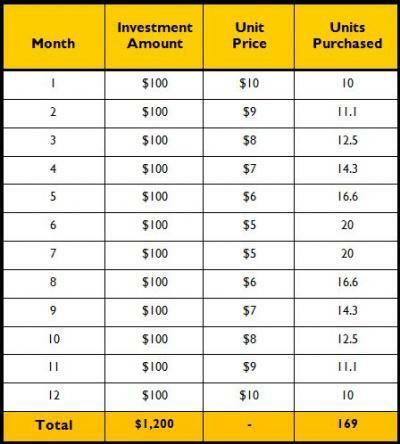 As shown in this example the investor has set aside $1,200 and now owns 169 x $10 units = $1,690, a profit of $490 in 1 year. Dollar Cost Averaging does not guarantee a profit. If you are prepared to sell at the bottom of a falling market you will lose money. This is where the discipline to continue on in your strategy is most important. The strategy relies on you investing, not this month or the next month, but every month. For those that are still in active paid employment, we are most likely reaping the benefits of Dollar Cost Averaging through superannuation. Your superannuation contributions would be made for you on a regular basis, which ultimately ends up in your investment strategy. So your superannuation fund can benefit from the concept of dollar cost averaging too. If you want to learn more about markets watch the 'how financial markets work' video. You can also watch this funny video on Discipline, Tim Clue on Discipline. In the example of dollar cost averaging we used the example of a Managed Fund, for more on managed funds. Our Savings Calculator can show you the outcome of saving small amounts of money over a longer period of time.